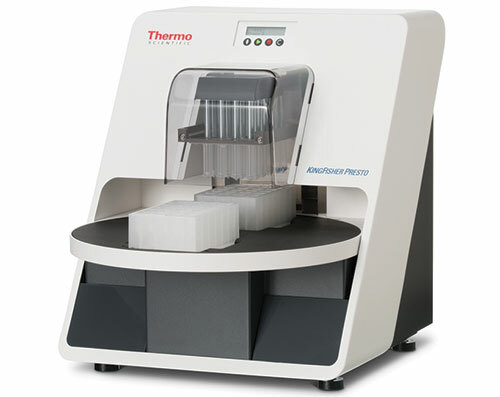 The new KingFisher Presto is a sample purification system that isolates nucleic acids and proteins for high-throughput labs. The system is designed to be part of an automated workflow using a liquid handler with a gripper or robot arm to purify samples with volumes from 50 µL to 5 mL. The instrument’s small footprint allows for easy connection to several liquid handling instruments in either a side-by-side or on-deck configuration, allowing flexible selection of platform and use for a wide variety of applications. Stackable, polypropylene plates and tip combs are designed to be placed by a robotic arm and suitable for many biological applications, including projects that require a sterile environment.